Midday with host Liz Clayton, 12:05 to 12:30 pm, UMFM 101.5. Brad Fenwick & Shannon Whitehead held down the interview fort for the band. Played music from Annuit Corruptus, talked about many interesting things as usual. The Buzz With Gordo, 6pm - 7pm, Freq 107. We were on the air live for the show, played What You Don't Know live. Talked about upcomming April 5th show @ Osborne Freehouse, past recordings, future plans. Beer For Breakfast with host Broose Tulloch, 10:00 to 11:30, CKUW 95.9 am. Paulette LaFortune of Sweet Spot Productions and Brad Fenwick and Peter Baureiss of The Antigravity Project were on air to promote The Maharaj's Dinner Party and The After Party on June 26th, 2005 at the Exchange Event Centre. Schmooze Queen Olga Krywyj of UMFM 101.5 joined in (she had an earlier interview). The conversation drifted to a discussion about music, film, organics, and Monsanto!!! The Big Breakfast, 7:00 to 9:00 am, A-Channel Manitoba. Paulette LaFortune of Sweet Spot Productions and The Antigravity Project were up bright and early to promote The Maharaj's Dinner Party and The After Party on June 26th, 2005 at the Exchange Event Centre. Ultrasonic Film with host James Borsa, 10:00 pm to 11:00 pm CST (re-broadcasted Sunday, 7:00 am to 8:00 am and Tuesday, 6:00 am to 7:00 am), UMFM 101.5. James interviewed Clayton Stewart about the making of the movie Star Wars: The Evil Within and played The Antigravity Project's original music that was used in the Uballi Groken bar scene. newwinnipeg.com The skinny on Star Wars: The Evil Within by Culture Editor Alex Reid. The Big Breakfast, 7:00 to 9:00 am, A-Channel Manitoba. The Antigravity Project appeared on A-Channel's Big Breakfast to promote the upcoming world premiere of Star Wars: The Evil Within. We played 'Shoulder of Orion', Dagoonda (which is the song that we sing in the movie), and 'Life is Like That'. 13th Cloud Productions demonstrated some fight choreography moves and Matt Vosper (lead actor) talked about the light sabers he made for fight training. We also gave away an Annuit Corruptus CD and a pair of 'Gold' tickets to the world premiere on Saturday, March 19th. We had a blast!!! The Winnipeg Sun. 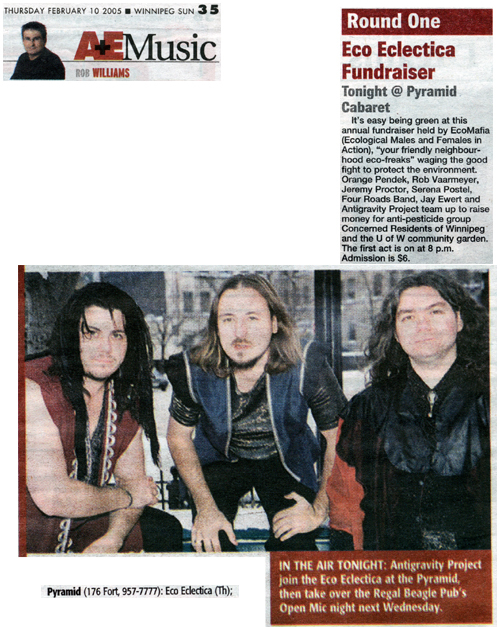 A little press on the Ecoeclectica Annual Fundraiser show we did at the Pyramid on February 10th, 2005. Aren't we handsome fellows!!! UWSA Stylus Magazine. TAP's show at the Royal Albert Arms on January 17th, 2004 was named one of the top 5 live acts of 2004!!! We played 3 songs for a total of a 50 minute set!!! It's an honour!!! The Uptown. Feature article by Don Beat about the ElementSircus Winter Solstice Celebration on Tuesday, December 21st at the Pyramid Cabaret. Free Range Radio hosted by Jared McKetiak, 6:30 pm to 8:00 pm CST, UMFM 101.5. Brad Fenwick, bass player and lead vocalist for The Antigravity Project chatted with Jared about what the band has been up to and what everyone can expect from TAP in the new year. Brad also talked a little about last year's Autumn Art Music Expo and the band's newest project Metronomicon, the song and video to be released at ArtSonic on Friday, October 1, 2004 at the Ramada Entertainment Centre. One of our best interviews yet!!! Thanks Jared!!! River City Rawk Show with host Lochlin Cross, 11:25 pm, Thursdays, Power 97. Lochlin Cross did a a pre-recorded interview with The Antigravity Project on April 28th which aired on the RCRS on May 6th. He chatted with us about progressive rock music and played three of our favourite TAP tunes... Paper Dolls, Want To Believe and Omniceros!!! The Winnipeg Sun ... and we already knew we were not from this planet... this review just confirmed it! The Uniter, UWSA Weekly Newspaper. The review that was posted by NewWinnipeg.com on February 25th, 2004 was also printed in this issue!!! Thanks again Jon!!! newwinnipeg.com. A great review by Jon Symons of the Uniter. Schmooze Buzz hosted by Olga Krywy, 10:00 am to 11:00 am CST, UMFM 101.5. Special follow-up coverage of the Solstice Circus Celebration event at the Pyramid Cabaret on Sunday, December 21st. Interviews with The Absent Sound, Kiva, Victoria Prince, Mynor the Irrational, Eve Rice, Dave McKeigan, The Easter Bunner and more!!! Where the hell was The Antigravity Project when all of this was going on? We were playing of course!!! The Uptown. Pre-show article by Melissa Martin about the Solstice Circus Celebration on Sunday, December 21st at the Pyramid Cabaret. The Projector, Red River College's Newspaper. 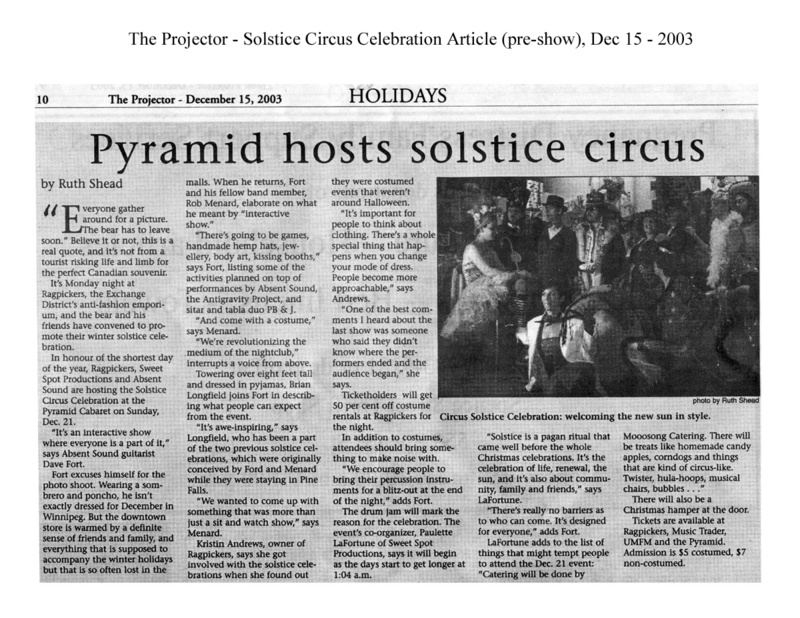 Pre-show article by Ruth Shead about the Solstice Circus Celebration on Sunday, December 21st at the Pyramid Cabaret. Ragpickers Antifashion Emporium & Books, 216 McDermot, 7:30 pm to 9:00 pm. The Absent Sound, The Antigravity Project and production crew met the media for an exclusive photo shoot and press conference to let people know about the Solstice Circus Celebration at the Pyramid on Sunday, December 21st!!! Schmooze Buzz hosted by Olga Krywy, 10:00 am to 11:00 am CST, UMFM 101.5. Dave Fort and Rob Menard of The Absent Sound and Peter Baureiss of The Antigravity Project talked with Olga about the 3rd Solstice Circus Celebration event at the Pyramid on Sunday, December 21st. The interview was also aired on Wednesday, December 3rd from 6:00 am to 7:00 am CST and Sunday, December 7th from 7:00 am to 8:00 am CST. UWSA Stylus Magazine. A great review by an even greater friend, Rob Vaarmeyer, or as we all know and love him 'Buddha'. The Winnipeg Free Press, TAB Magazine. The Antigravity Project's second ever CD review (don't know which one was written first!) by Entertainment Editor Bartley Kives. The Uptown . The Antigravity Project's first ever CD review by Uptown Editor John Kendle. Thanks John!!! Winnipeg @ Home. The Antigravity Project was named 'Band of the Week' (November 24 to November 30, 2003) by winnipegathome.com. "Where there is no place like home!" The Connoisseur's Guide To Jigger's Musical Galaxy hosted by Marc Giguere, 12:00 to 2:00 pm, UMFM 101.5. The second segment of the show from 1 to 2 pm is mainly dedicated to progressive rock. The Antigravity Project was interviewed about our new release Annuit Corruptus. We discussed the concept of the album and Marc played tracks 7, 5, and 8 'Illuminazi', 'Secret Knowledge Thwarted', and 'Orwellian Nightmare Revealed' in that order. We also talked about the history of the band, Phlogiston I, and current projects. Drivin' With Gordo/The Buzz hosted by Gordo, 2:00 to 7:00 pm, 92 CITI FM. Live radio interview from Smitty's Lounge, 580 Pembina Hwy. We went on at 6:50 pm. Gordo chatted with us about our new CD Annuit Corruptus and played track 2 from the album 'Paper Dolls'. Gordo liked the production and wants us back on the show again! The Big Breakfast, 7:00 to 9:00 am, A-Channel Manitoba. We plugged and played three songs from Annuit Corruptus... 'Secret Knowledge Thwarted', 'Want To Believe', and 'Strategy of Tragedy II'! We also talked about our Halloween Show at the Regal Beagle, Ramada Malborough and gave away an autographed CD! The show was a blast! We had lots of donuts and well-needed coffee! Sunday Dinner hosted by Rob Vaarmeyer, 5:00 to 6:30 pm, CKUW 95.9 FM. An interview with T.A.P. and Paulette LaFortune, our manager. We performed a few songs and played a few tracks from our new album Annuit Corruptus. We talked about conspiracy theory a little and promoted our CD and upcoming shows. Talk To The Experts hosted by Paul Graham, 4:00 to 6:00 pm, CJOB 680 AM. We were invited on the show by CEO of Jory Capital Inc., Patrick Cooney. We discussed world events and their affect on financial markets. This was a unique opportunity for a band to weigh in on topics of corporate corruption, wars, and problems facing the financial state of large and powerful corporations and countries. We asked questions that many would like to ask the financial experts, and got to give opinions given our more philosophical and anthropological perspective on life. Midday hosted by Liz Clayton, 12:05 to 12:30 pm, UMFM 101.5. An interview about the history of the band and plans for the future with new drummer Peter Baureiss. Plugged our show that evening at Wise Guys on Campus, Evolution of the Scene hosted by Screemin' Chix Productions. We played an acoustic version of one of the songs on our unreleased album Annuit Corruptus. NewWinnipeg.com. Freelance writer for newwinnipeg.com Joyanne Pursaga caught our grand opening at new local indie venue Club 58. She interviewed Brad Fenwick our lead vocalist and bass player and reviewed the show. News @ Night, The A-Channel Manitoba. The A-Channel sent a camera person to catch part of our show at Club 58 and aired it later that night. Sunday Dinner hosted by Rob Vaarmeyer, 5:00 to 6:30 pm, CKUW 95.9 FM. We played some of the recorded material from our unreleased album Annuit Corruptus, some new stuff and music from a few of our favorite bands. We have an audio archive of the show if anyone is interested in a copy.